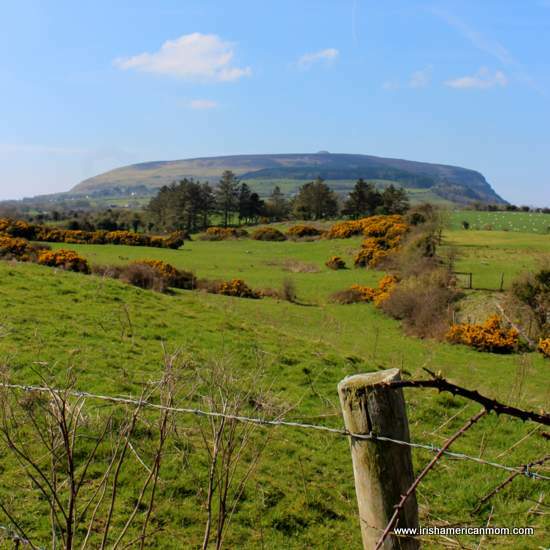 You are here: Home / Lessons for Tourists / Land and Culture / Knocknarea And Queen Maeve of Connacht. 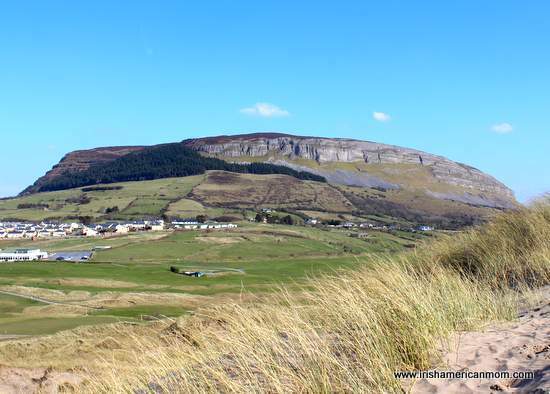 Knocknarea dominates County Sligo’s skyline, and together with Ben Bulben, these two peaks are the most striking landmarks in the entire county. Today I thought it’s high time for a scenic interlude, and what better subject matter or mountainous model could there be for a blog post, than the magnificent Knocknarea in County Sligo. 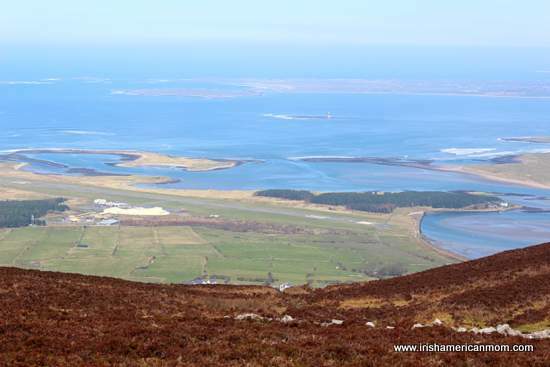 So why not join me, on a tour of Knocknarea, a perfect spot for a little mid-week Irish intermission. 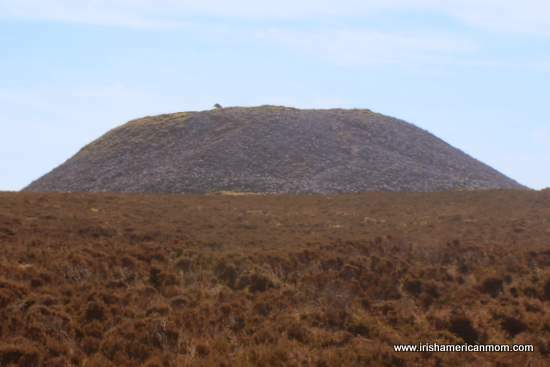 Atop the mountain sits a giant rocky cairn otherwise known as “Queen Maeve’s grave”. In the photo above look directly over the dolmen and you’ll just make out a little mound which is in fact a massive stone cairn. Maeve’s cairn is a little more clearly defined in this photo. Yeat’s wrote that “the wind has bundled up the clouds high over Knocknarea”, but I was lucky on the day of my climb, there was hardly a cloud in sight. 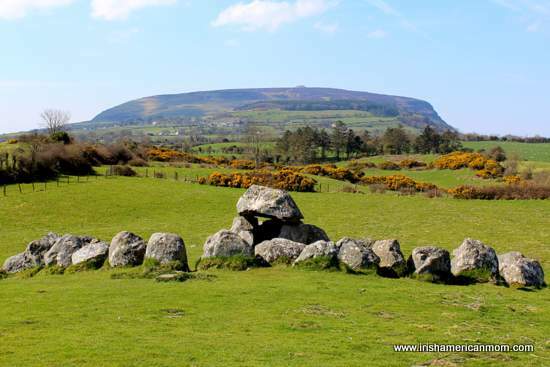 In the Irish language or Gaelic, Knocknarea is called “Cnoc na Rí” (pronounced Kinnuk nah Ree) which means “Hill of Kings”. 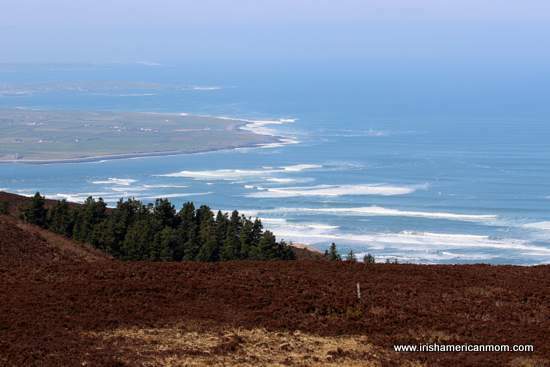 This beautiful summit was so named since it is said the ancient Kings of Connacht were once crowned on its peak. Other interpretations of its Irish name exist including Cnoc na Riabh, meaning “hill of the stripes” or Cnoc na Ré meaning “hill of the moon”. 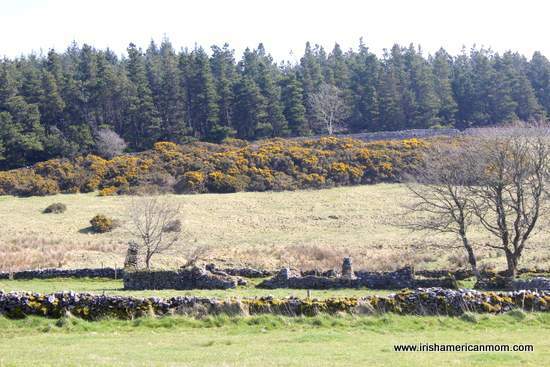 But nowadays it is better known as the hill of Connacht’s greatest queen, the legendary Queen Maeve. Her grave or cairn is called “Miosgán Meabha”. The cairn’s circumference is 600 feet, and its height is 34 feet. It’s estimated there are about forty thousand tonnes of stones piled high atop this mountain in her honor, proving she was a woman of immense power. Maeve is supposedly buried here standing up in a warrior’s stance. Now it’s totally up to you whether or not you want to believe this tale or take it with a pinch of salt. The cairn has never been excavated, so we may never know. Local legends say it is good luck to bring a stone up the mountain to place on the cairn, in remembrance of Ireland’s warrior queen, but whatever you do, don’t touch a stone. It’s bad luck to take one away with you. 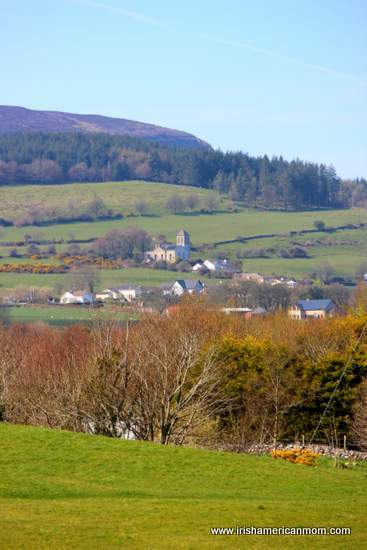 Tourists and locals can hike to the top of the hill to pay their respects to Maeve or to drink in the views that await after their stiff climb. I huffed and I puffed all the way up, but don’t worry I didn’t blow the cairn down. 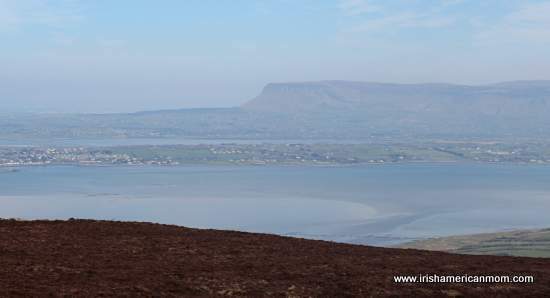 On a clear day you can see for miles, and drink in the beauty of County Sligo. The panoramic view Queen Maeve will witness on the Last Day is hard to beat. Looking towards the west and the village of Strandhill, waves crash against the rocky shoreline, finishing their journey all the way from America. Away to the north Ben Bulben stands proudly. The beautiful rivers, lakes and woodlands surrounding this idyllic spot make it clear why the wily Maeve chose this mountain as her last resting spot. On the way back down I noticed this old ruin. Every time I see the crumbling walls of an old cottage I say a little prayer for the folks that once lived there. My hubby noticed this outline in a field on the side of the mountain. 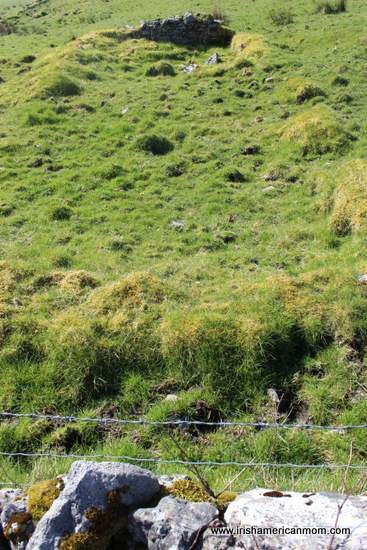 These ridges are all that remains of a little stone cottage from days gone by. This church on the southeastern side of the mountain is truly picturesque. 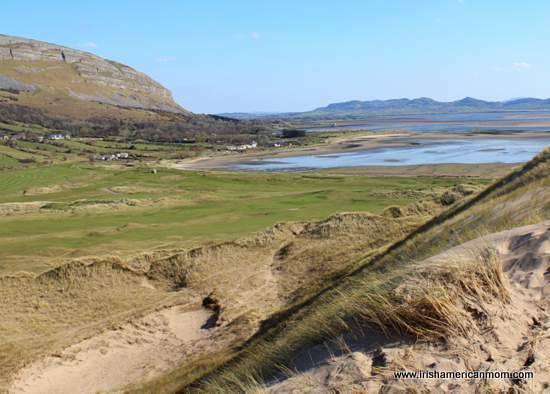 The western side looks over the beautiful village and beach of Strandhill. On a fine day it’s absolutely heavenly. 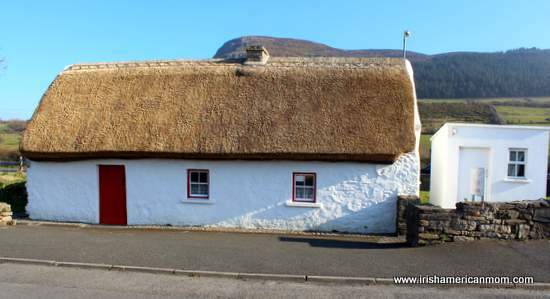 Dolly’s Cottage has stood for 200 years in Strandhill, nestling at the foot of Knocknarea. The mountain looks over some of the most splendid beaches in all the world. 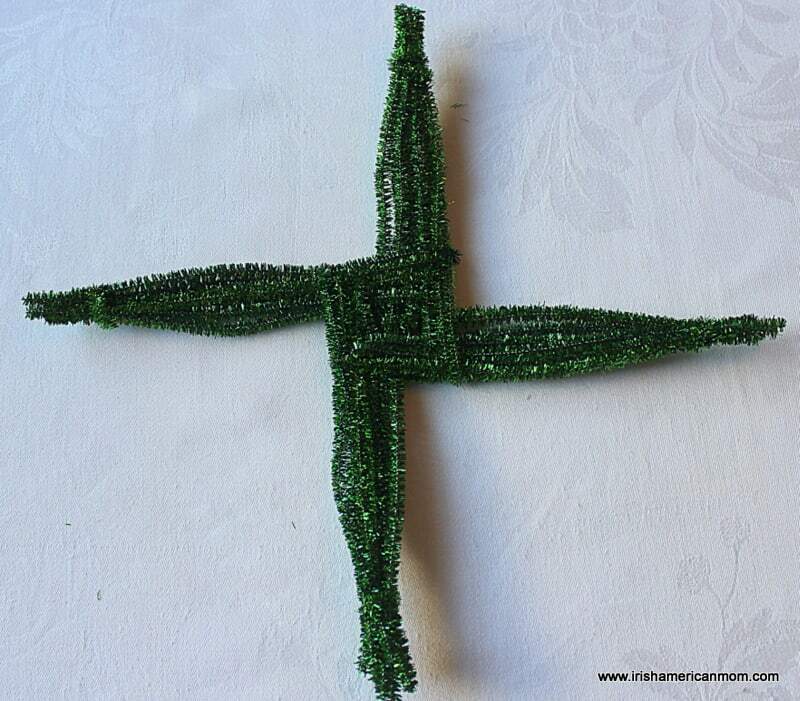 Thousands of years have passed since Ireland’s first inhabitants arrived here. I’m happy to say many of the tombs, stone circles and fortresses they built still remain to this very day. Walking through this unspoiled countryside you feel inspired and invigorated by the ancient past. I climbed Knocknarea over forty years ago with my grandaunt. I remember listening to her stories of ancient warriors and proud, strong women. As I climbed Knocknarea once again I revisited fond memories of my childhood, following in the footsteps of Queen Maeve and my late grandaunt. Of course I recounted her tales to my children, introducing them to Ireland’s brave queens and mythical heroes. Wow, what a view from the top! Absolutely beautiful country. 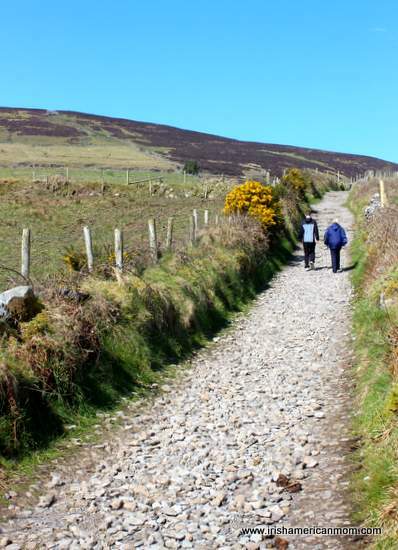 So glad you got to make the climb again, Mairéad, and so neat that you got to do it with your children this time! Cheryl – They really enjoyed their climb to the top of the mountain. When we made the trek the sun shone brightly. It was just glorious. I visited Knocknarea touring Ireland in 2008 and I really loved the place!!! I hope I will take my daughter on the trail to Queen Maeve’s tomb one day. Cheers!! Claudia – I’m so glad you enjoyed this little corner of Ireland. There is something magical about Sligo. I hope you get to take your daughter there someday soon. Beautiful Mairead, I have no doubt The warrior Queen is positioned in her warrior stance, as sure as I’m sure her brave demeanor is passed on through to the women of Ireland today, be they in Sligo, Dublin, or Kentucky. 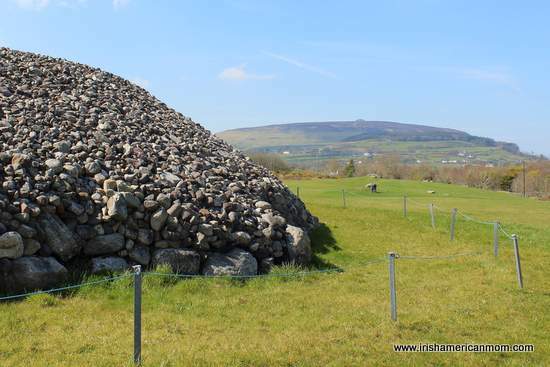 Hi Brian – I too believe our good Queen Maeve is standing erect beneath that mound of stones. And what a magnificent spot she found as her last resting place, even if she chose to stand rather than lie for her rest. She sure was a strong woman and an inspiring legendary figure from Irish history. 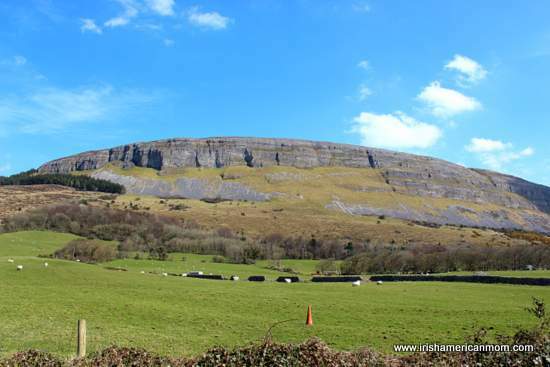 Hi Mairead, Lovely post as always and wonderful pictures of Sligo. I would like to add something about the Sligo area. The reason Yeats wrote poetry of Sligo and why it was close to his heart was he first visited as a guest of the Gore-Booth family. The Gore-Booths were Anglo Irish gentry and lived at Lissadell House. 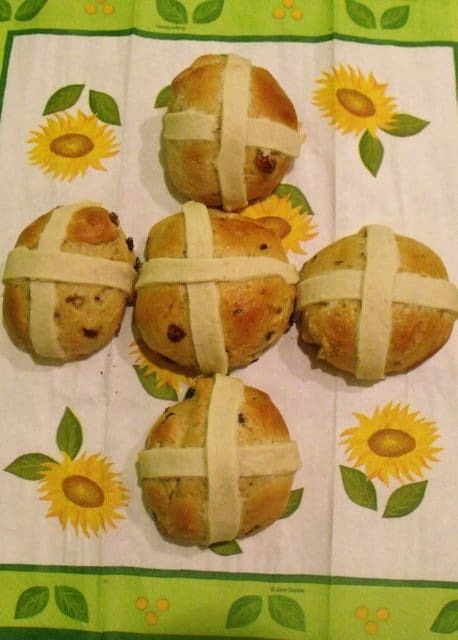 I have several posts about them @ celticthoughts.com. The Gore-Booths were known as good landlords and Constance Markievicz (nee GoreBooth) is most known for her part in the 1916 Easter Rising. Anyway after the Civil War, the house fell on hard times and lost all its grandeur due to legal fees and a lot of political and economic problems. The good news is a wonderful family bought the house a few years back and restored it beautifully, including the gardens which at one time had supplied plants all over Europe. 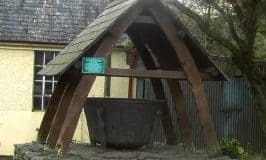 Today LIssadell House is open to the public and also houses lots of historical documents as well as original paintings and memorabilia. I am fortunate that I will be visiting Lissadell House in July. .
Brighid – You are so lucky to be visiting Lissadell in July this year. I heard it had recently reopened to the public. 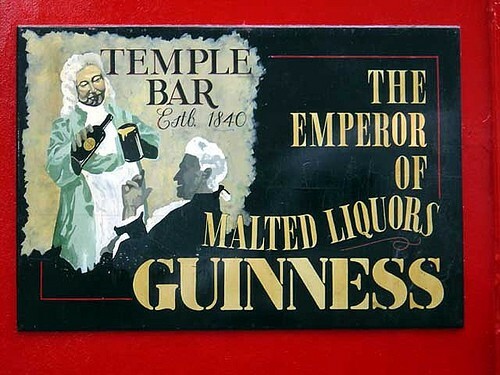 I remember visiting there as a child, but it was not open when I last visited Sligo. Next trip to Sligo, I must return. 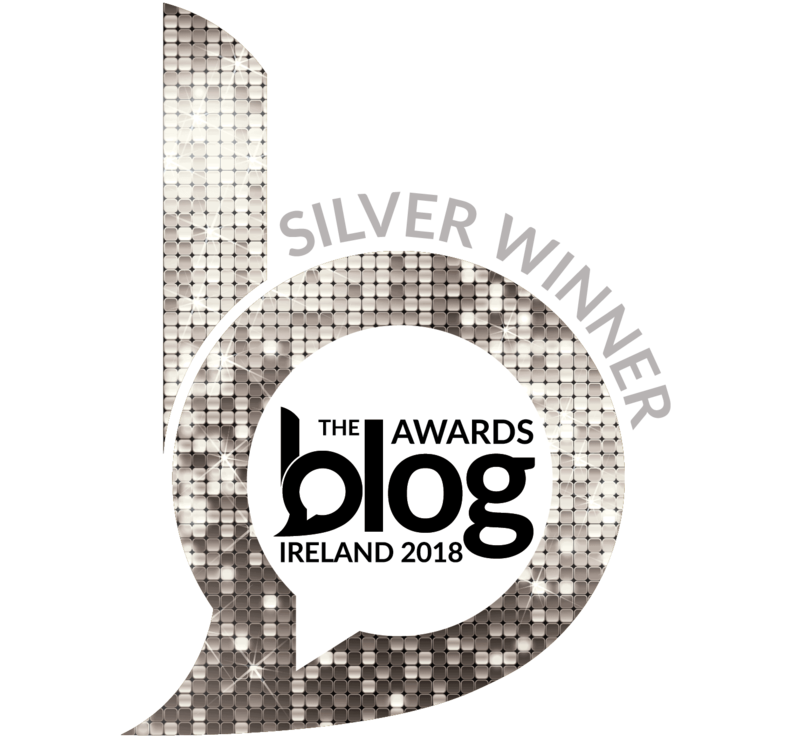 Thanks again for adding such wonderful information about Sligo to our discussion.